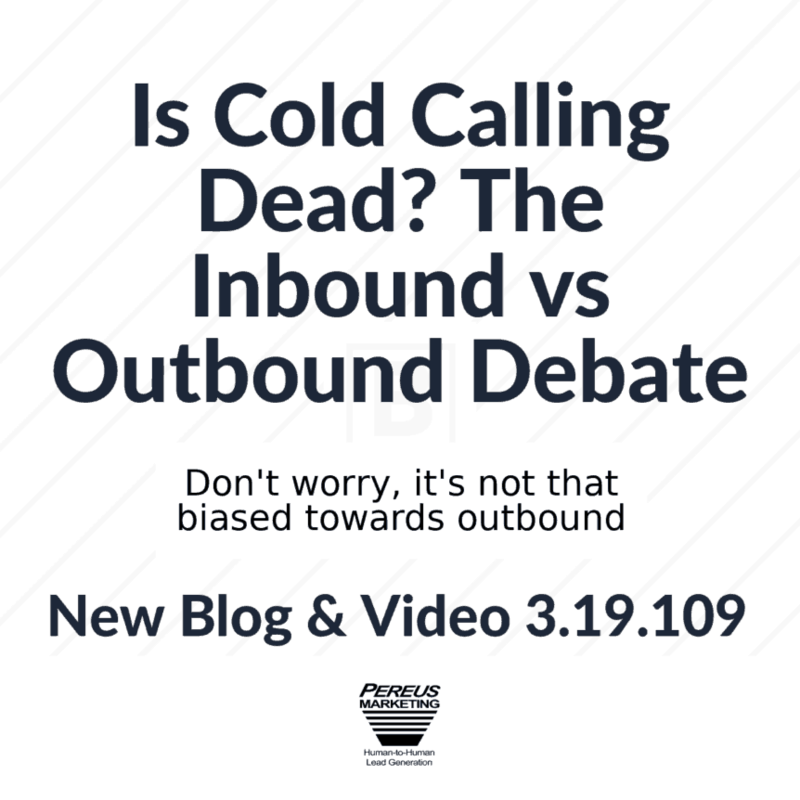 Is cold calling and outbound lead generation dead? …Is inbound alive?? I’m super biased so stop here if you care. But no. Straight up. Cold calling is not dead. Here’s the problem though – Cold calling and outbound lead generation calls get a bad wrap. Let’s talk inbound before anything else. I’ll be the first to admit, inbound is extremely alive and provides heaps of quality leads to companies. But when comparing outbound and inbound, let’s be clear, we are talking about 2 different sides of the same battery. Inbound and outbound are two different energy forces that are equally opposite to one another but work together. Delving deeper, inbound is order taking, and for good reason. All the work has been done for you. The prospective client has searched for the right key words, found your page, watched some videos, read some content, and made the call to you with their credit card all but ready. Your job as the inbound marketer is done way prior, and your job is to consistently refine it to increase the inbound inquiries. THIS IS NOT OUTBOUND. While inbound is great, so many inbound marketers and order takers are waiting by the phone twittling their thumbs because they have maxed out the amount of inbound leads on a daily or weekly basis. While inbound is always desired, it doesn’t always produce the results as much as you want or when you want…It also doesn’t exactly sharpen your sales skills. These phrases are unfamiliar to inbound marketers, as it appears aggressive. I think that’s where the positive and negative sides of the battery come in. They are characteristically way different, but are both working for the same purpose – to win prospective clients over towards a new idea, product, or service that will benefit them. This is not to say that outbound has its challenges. In outbound, many times you need as much as 3 to 5 times the amount of touches with a prospect to keep the relationship continuing forward. Sending additional collateral, confirming appointments, rescheduling appointments, connecting on Linkedin, sending personalized videos. This is A LOT more effort. It’s very difficult to conceive these extra touches make an impact, however, think about all the touches your content, videos, and website provided for someone who was already in need of your service to encourage them to call you. Building familiarity needs to happen either way, even though it doesn’t feel like it with inbound. Our tagline is “conversation that connects humans to products and services.” What words do you say to spark the most amount of interest? What questions do you ask? At what point do you want to move them to the next step? How do you back off without giving up? What references do they need? Did you like their Linkedin post? These are the types of outbound conversations and efforts needed while leading someone to the next step. If it feels like more, that’s because it is. The most significant difference though with this type of effort in outbound is you are leading them, rather then them leading you. If you know how to lead, you have much more control of your destiny. With control of your destiny, you can grow when you want and scale at-will.